Wait! Here’s the very first question that begs to be answered – Is the Obcasio a scam or legit? Is it genuine? I run a detailed research and am going to answer to the question above in the Obcasio review below. It is important that you read through it before you decide to sign up for Obcasio. Obcasio login page: www.obcasio.bz / www.obcasio.co /etc. Verdict: Dangerous SCAM!!! I give zero recommendation to the program which shows no transparency and lies with a straight face. If you want to learn how to make legit income online (I guess that’s what you want) then don’t dance with Binary Options. Binary Options, even though seemingly easy to trade, is in fact a very high risk trading opportunity. You must be prepared to lose all your investments. Binary Options are NOT suitable for ordinary people from the street! However, there is a fail-free (and safe) way to learn how to make passive income online. Even if you are a complete newbie. If you are diligent and willing to supply dedication, I will show how you can start making from some side money to full time income online. Click here to see what this system is and how it can help you! 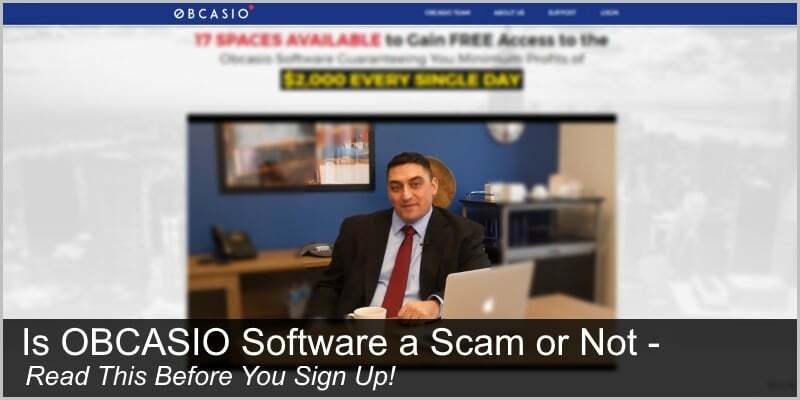 Full Review – Is The Obcasio a Scam or Legit? Michael Watson, the alleged founder of Obcasio software does not bother to give out much about himself or his genius Obcasio trading app. What you mostly get is a pure sales pitch. Before the 2005 market crash, Michael Watson was one of those Wall Street sharks, working for the largest investment banks in the world. However, he had a dream and it was to launch his own trading organisation. 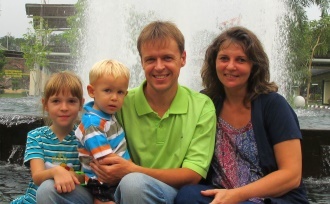 When the global financial crisis hit the markets in 2005, Michael saw his opportunity. He left his job, rented an office in Manhattan and recruited some of the best traders into his team. To make a long story short, Michael’s team developed and launched the Obcasio Binary Options trading software. In 2014 Michael Watson opened the doors to 100 new members (ordinary people of the streets). 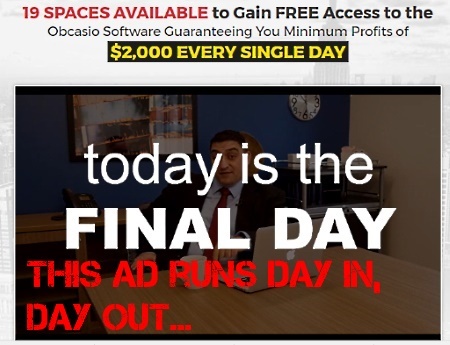 He gave them a free access to the Obcasio software and guaranteeing them a minimum daily profit of $2,000 every single day. This year, Michael’s team is taking on another 100 people (just 20 people per day) over a 5 day period. Today is the final day. 100 people in total, all guaranteed to start making $2,000 per day, starting now. Today is day 5, your last chance. Note!! It is very important that you read through the whole review before you hurry to sign up with Obcasio. I will show you exactly what you can expect from it. 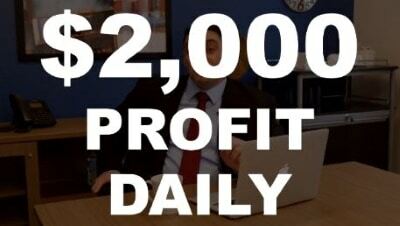 Obcasio will guarantee you minimum $2,000 every single day, $14,000 a week, $60,000 a month, $730,000 a year – for life. The initial deposit $250 is the only deposit you ever need to make. For you, Obcasio is 100% hands free. Its autopilot does all the trading for you. Well, if these promises are genuine, it is pretty much dream come true. The question is – Are they genuine? What if they are fake? Is the Obcasio a scam or not? Now I am going to prove that it is a scam – designed right from the very core for the sole purpose of ripping you off and leaving you in ruins. 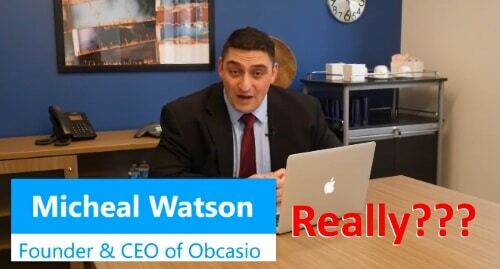 Michael Watson, the founder of Obcasio trading app is nothing but a fictional character, played by a paid actor. This time, however, they have hired Miah Washburn from Portland to do the job. As always with such shady schemes, all testimonials are fabricated as well (thrown together based on the script and then, if needed, played by some cheap actors). 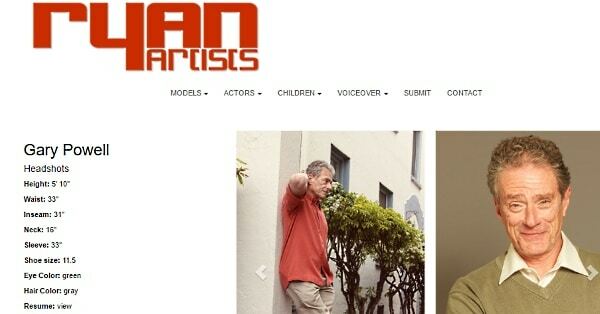 In the case of Obcasio scam however – surprise, surprise – they have used real actors from Portland, Oregon. Here you can find her LinkedIn page. 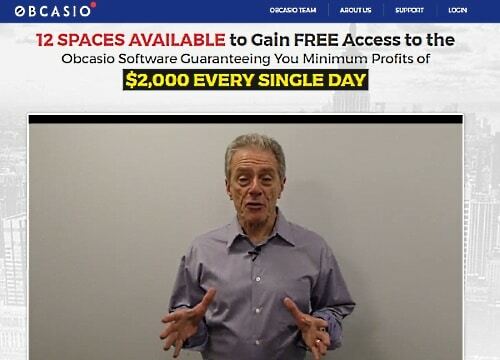 You think the guy [pictured] is an average from Joe who accidentally stumbled upon Obcasio software and is now accumulating thousands of dollars every day? Not only that. 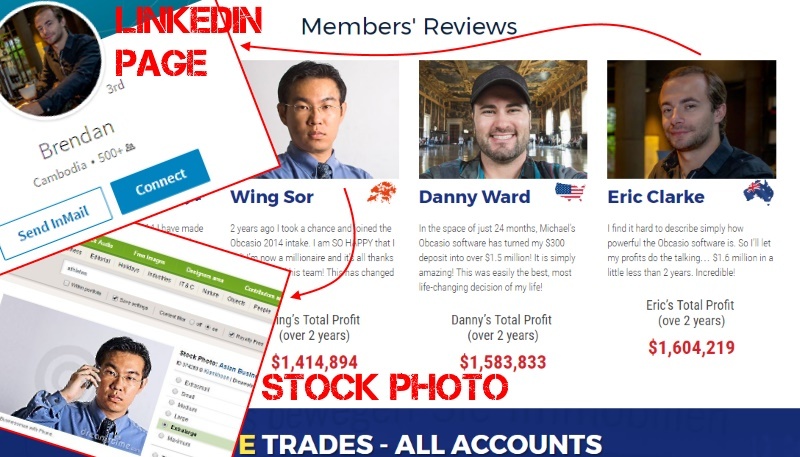 Gary Powell has participated in other online scams as well – Jarvis Formula Binary Options scam, Nesdek Inc scam, Quantum Vision System (playing Dr. William Kemp), etc. I struggle to understand what causes respected people falling so low that they sell their soul to such wicked schemes. As you can see in the image above, the face image of Wing Sor is a stock photo, downloaded from Dreamstime.com. Eric Clarke’s face image, however, belongs to Brendan Gallagher. As you might suspect, their video is not a live show. It is recorded at least year ago. It means, every single sentence and promise in it is burned into the video. Not only that. The screenshot above is taken in March 9, 2019. Notice, it’s the final day and there are last 19 places available. It’s like people are rapidly grabbing for the few remaining seats and if you want to gain free access to Obcasio, you must hurry. However, refresh your browser window (Ctrl-F5) and the free spots are up to 20 again. Simple – It’s called FALSE URGENCY. Their only goal is to make you sign up at once. You find NO truth anywhere in the Obcasio website. You find NO real information about the founders and owners behind the product. NO real Obcasio company with real physical address. The only things that they will give you are a fake narrative with fake demo and fake testimonials. How on Earth can you trust them? I can’t! You can’t either! How Will They Scam You? In order to start trading with Obcasio software, you first need to open a new trading account with a Binary Options broker of THEIR choice. This broker, however, is some shady unregulated offshore company. Second, you need to fund your newly created account with minimum $250. It is real money, YOUR money. Third, the Obcasio sign up process requires that you surrender them your phone number. It means that you can expect tons of phone calls from the scammers. Their single goal doing that is to make you invest bigger and bigger sums into their system. Not only that. They will also use every trick in their toolbag to make you give away your sensitive credit card as well. After that… I leave you to guess. Verdict: Obcasio is nothing but a dirty SCAM! Designed to rip you off. Stay away!!! How to Start Making Passive Income Online in a Safe Way? Now that you have read the Obcasio review, what are your thoughts? Is the Obcasio a scam or legit? I’ve never trusted binary options, I guess there might be a company that does honest trading using this method but I’ve not found one. Obcasio seems to be on of the worst I’ve have seen. I’ll definitely be staying away from this, thank you for the warning. Any sort of trading requires you to have money you’re happy to lose, I just can’t bring myself to see this as an investment opportunity, to me its gambling and the phrase ‘a fool and his money are soon parted’ popped into my head when I read this. I’d much rather build a profitable business using a legitimate method, affiliate marketing. Thank you for highlighting these cowboys. Hi Jenny and thank you for the comment. I don’t like trading binary options either. The big trouble with them, though, is that binary options look like an easy opportunity to make some quick cash. So they are highly popular and con artists exploit that popularity a lot. As a result, thousands (if not millions) of innocent people fall victims to these wicked schemes. It is just tragic. That’s why I write these reviews – to raise awareness about these dangers and save people from falling victims. Als, I try to offer legitimate and safe opportunities to make some side money online. One of them (in my humble opinion the best one) is here.